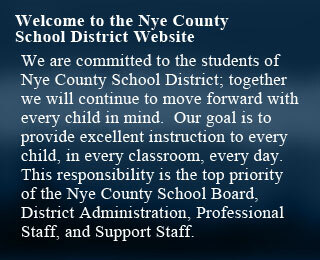 Nye County School District believes that an orderly learning environment is critical for students' academic success. Student discipline, when required, should be administered in a caring school environment where good citizenship behavior is taught. School Discipline Plans will reflect a progressive process and consequences from simple misbehavior to severe discipline problems. A list of prohibited conduct / unacceptable behavior, as well as the recommended/mandatory response to that conduct, are contained in the Parent/Student Handbook and linked here for reference. No individual shall be subjected to prejudicial treatment or to the abridgment of his/her rights to attend and benefit from public school on the basis of any of the following: economic status, race, ethnicity, culture, religion, disability, sexual orientation, age, linguistic ability or gender or for the exercise of his/her rights contained within this policy. For questions or further information, please contact your child's principal.